The Fragment Content wizard page allows you to customize the fragment properties and specify the fragment host. A ID is mandatory and must comply with the plugin.dtd. It is recommended - but not mandatory - for the fragment ID to match the project name. A Name is the translatable presentation name of the fragment. This field is required. A Vendor is the translatable name of the fragment vendor. This field is optional. 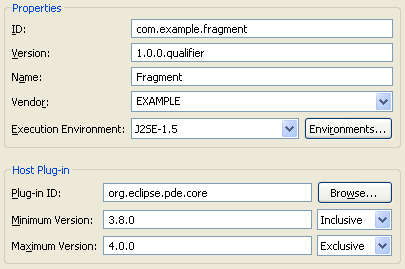 Execution Environment refers to the required execution environment (symbolic representation of a JRE) of your plug-in. This field is optional but recommended to be set. A fragment must specify a host plug-in that it will add functionality to and the host version range that it requires. The host Plug-in ID must refer to the ID of a plug-in that already exists in the workspace or the target. The host Minimum Version and Maximum Version are of the form major.minor.micro.qualifier.